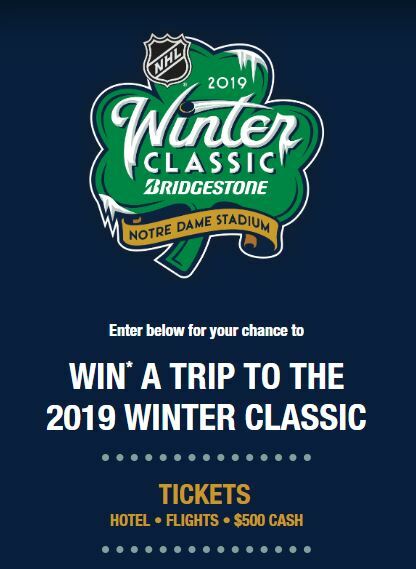 Enter the new CIL NHL Contest 2018 for your chance to win a trip to the 2019 Winter Classic. This contest is open only to legal residents of Canada (excluding the province of Quebec) who have reached the age of majority in their province or territory of residence. To enter you just have to visit the official contest web site and complete the online entry form with all the required details including name, last name, residential address, city, province, postal code, phone number and email address. If you want 10 additional entries to the draw you can purchase any participating CIL paint product at a participating Home Depot and enter the product code on the entry form. Contest closes at 11:59 pm on November 30, 2018. Winner will be determined by random draw from all eligible entries. The CIL NHL Contest 2018 begins on 12:00 am ET on October 9th, 2018 and ends 11:59 pm ET on November 30th, 2018. The random draw will take place on December 7, 2018. Winner will be contacted by email or phone.